We all love our furry friends, the memories we’ve made with them, the time we’ve already shared. We look back fondly on the early days, the excitement of bringing a brand new pet home, naming it, and giving it all the love. Sadly, just like us, our furry friends get older, and with age comes certain health problems. One of the most common problems found senior pets, is arthritis. According to many sources, arthritis is the inflammation and stiffness of joints, which can sometimes be extremely painful. The main type is osteoarthritis, the degenerative joint disease that comes with the passing of age. Osteoarthritis is characterized by the chronic inflammation of the joints due to the breaking down of cartilage around the joints. Age is usually a heavy factor when referring to osteoarthritis and as your pet ages. Arthritis will most likely worsen without proper treatment to ease the process and make your pet more comfortable. In both dogs and cats some symptoms are common across the spectrum. Difficulty go up: stairs, beds, sofas, etc. While these symptoms are common, at the end of the day, arthritis is personal to your pet, their lifestyle and how they are brought up. No case of arthritis is going to be exactly identical for all pets, it differs for every new case. It is up to you as the owner to observe and love your furry friend. If you notice any changes in behavior or demeanor, bring your pet in to see your veterinarian. There are ways to prevent and, if needed, treat arthritis. Large dog breeds tend to be genetically predisposed to joint problems particularly in the hips and elbows. A way to prevent that is to keep pets at a healthy weight. Exercise is a good way to help maintain weight as well as beneficial to your pets overall health. Weight management and regular exercise are not only good preventatives but are also good once arthritis has set in, as excessive weight can increase pain and progression of symptoms. Other recommended treatments include anti-inflammatory medications, supplements such as Omega 3 and injectable medications that protect the joint cartilage. 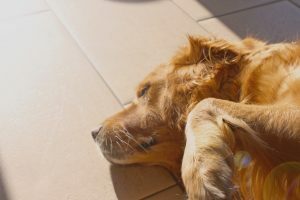 If you have any concerns about your senior pet's health, we recommend discussing arthritis and the treatment options with your pet's veterinarian at your next visit.